We are excited to announce our inaugural class of Women United Fellows! The Meredith E. Level Fellows Program connects emerging female business leaders with opportunities to improve the community alongside like-minded philanthropic women. The Fellows Program was implemented to honor the legacy and memory of Meredith E. Level. Meredith was a community champion, philanthropist and founding member of Heart of Florida United Way’s Women United. She was a beloved partner at Lowndes, Drosdick, Doster, Kantor & Reed with a solid reputation as a leader of the firm’s charitable endeavors. 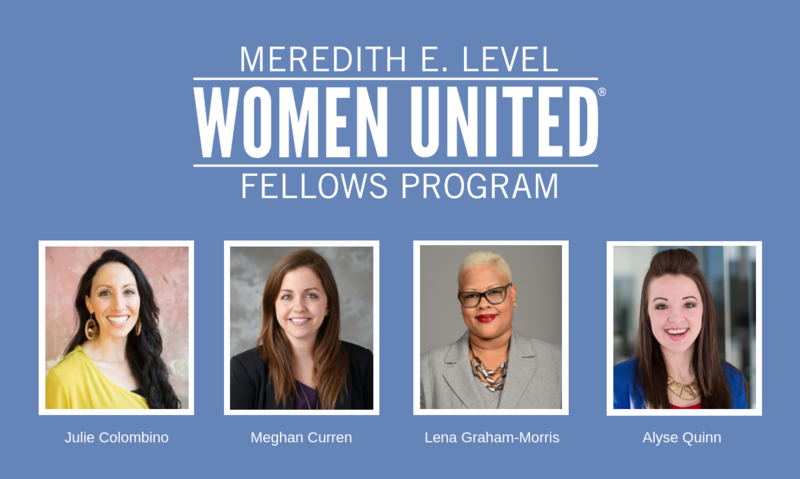 While we received many outstanding applications, the following four will represent the first Meredith E. Level Women United Fellows for 2019. Julie works as the CEO of REBUILD Globally. She has received the Southern Living Beaty Awards for her work as a female entrepreneur. Her other accomplishments include being a 2017 Digicel Entrepreneur of the Year in Haiti, the 2014 Credo Social Business Award, the 2013 Rally Award, the 2013 Young Leaders for Haiti Global Humanitarian Award, the 2012 Business Innovation and Growth Award from the Chamber of Commerce, the 2011 UCF’s Alumni Community Service Award and the 2011 Public Administration New Professional of the Year Award. Meghan is the Community Relations Director at AdventHealth. She has been involved with many non-profits, including Habitat for Humanity, Boys & Girls Clubs, Matthew’s Hope and Junior League of Greater Orlando as a past member. She has also participated in Leadership Osceola and Athena NextGen. Currently she serves as a board member for Community Vision in Osceola County. Lena is the Vice President of Marketing & Business Development at Horus Construction Service Inc. She serves on Clarita’s House Outreach Ministry (CHOM) Board of Directors as the Executive Strategist. She is also the Board of Directors VP of Development of Dress for Success and on the Advisory Board of Infinite Scholars Program. She received the 2018 Orlando Business Journal’s Women Who Mean Business Women to Watch award. Alyse is the Vice President/Co-Founder of Big Vision. She has been involved with community in a variety of ways. She is a board member for Junior Achievement of Central Florida, ATHENA Orlando, Junior League of Greater Orlando, Florida Abolitionists, City Year, Cystic Fibrosis Foundation and is the founder and organizer for Women in Communications. We look forward to the expertise and passion our new Fellows will bring to Women United. To learn more about the work Women United is doing in Central Florida, click here. Or join our Facebook group here! To learn more about the Meredith E. Fellows program, click here.